The second month of this year is already coming to an end, hence it's time to say Goodbye to February 2019. And what a February it was. Hardly any rain, lots of sunshine and partially cloudy to blue skies. As good as a February can get around Koh Samui. This morning saw blue skies with a few scattered clouds and by 11am it's 30C. Don't get fooled though, it feels a lot warmer. 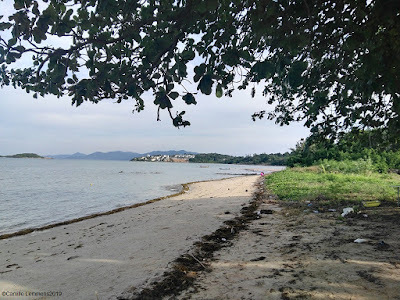 Maenam beach near Wat Phra Nha Lan and the Lomprayah ferry pier. Not Koh Samui nicest beach, the sand is rather grainy, but a nice and quiet beach. February is about the best month to visit our island. The temperatures are nice without being too hot. Especially the last couple of days there has been a fair bit of wind which brings a cool breeze. Bounty beach on Malapascua in the Philippines. The main beach stretch on Malapascua island. Here you can find most restaurants, dive shops and the like. Most of this month I have spent in the Philippines. Specifically on Malapascua island, teaching a PADI IDC there. Good times were had but it's also good to be back home and enjoy the last bits of this fab month. Hope you all had a good time on Samui during your stay and I'm looking forward to March coming on! The forecast for the first March week is looking good. Very similar weather were February ended, blue skies to partially clouded skies and no rain in sight. 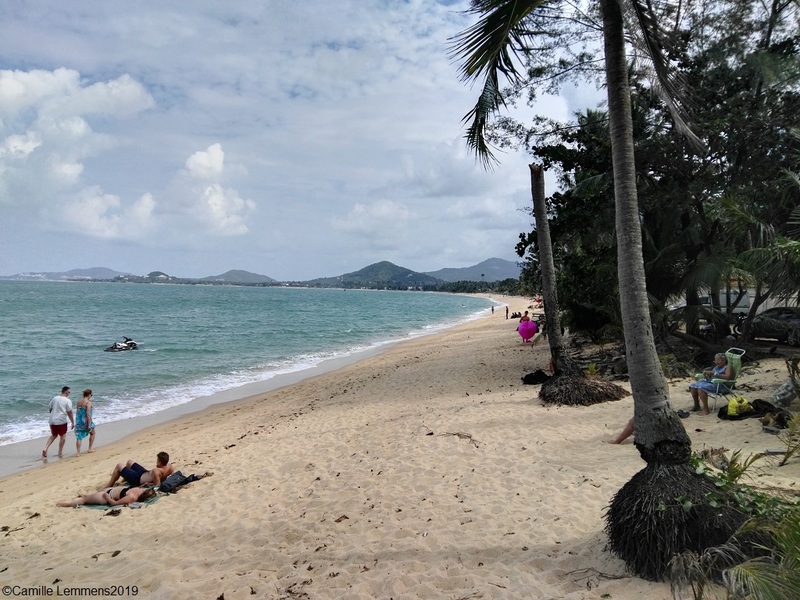 Sunday morning, long run in the bag and back home, it's time for the Koh Samui, Thailand weekly weather update; 18th February 2019 – 24th February 2019. It was a busy week, with lots of travelling. Leaving Malapascua in the Philippines for Cebu City. First off with a boat ride, followed by a 4 hour car ride. 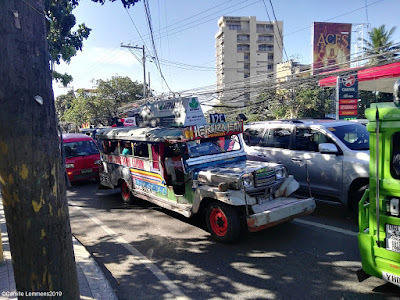 One night in Cebu city followed by a night near Suvarnabhumi airport in Bangkok. Friday morning I was back home, at last! Last week was a lovely February week around the island. Loads of sunshine and nice temperatures. Maximum reached 32C and the minimum hit 25C. February is a great month to visit Koh Samui! Proven year after year! The forecast for the end of this month is looking great. Sunny to partially cloudy skies and no rain are predicted. Enjoy your stay on the island and be thankful for what you got. Diamond in the back, sunroof top, diggin' the scene with a gangsta lean! Sunday morning, long run in the bag and time for the Koh Samui, Thailand weekly weather update; 11th February 2019 – 17th February 2019. On Koh Samui we have light cloud cover with plenty of blue spots over the ocean. The clouds are slowly disintegrating though, the heat of the sun is too much! At 10.40am it's 29C and climbing. On Malapascua in the Philippines we have completed the February PADI IDC and the PADI Instructor Specialty training. Tomorrow the PADI IE or exams start. It's already 11.40am here under a blue sky and the current temperature is around 30C. Koh Samui, Thailand weekly weather update; 11th February 2019 – 17th February 2019; Wat Pra Nha Lan in Maenam. Dragon on the lookout! Last week was a nice week with plenty of sunshine around Koh Samui. Maximum temperatures reached 31C and minimum 27C. Not too hot, but nice and sunny at the same time. Perfect February weather around Koh Samui. 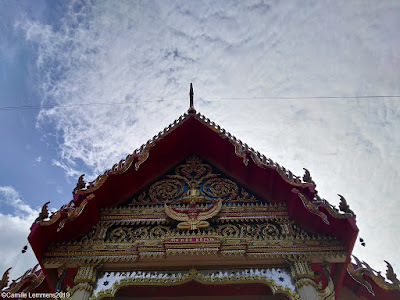 Koh Samui, Thailand weekly weather update; 11th February 2019 – 17th February 2019; New day rising on Malapascua. The early morning thresher shark dive at Monad shoal. The sun is rising and the tanks are ready. Early rise though, the boat leaves at 4.45am. Next week expect lovely weather conditions around our island. Plenty of blue skies and no rain is the prediction. Enjoy your time on the island. It's Sunday morning and time for the Koh Samui, Thailand weekly weather update; 4th February 2019 – 10th February 2019. It's just a quarter past nine in the morning on Koh Samui and we have a lovely blue sky pretty much all over the island. Current temperature is 29C and rising. Back in the Philippines on Malapascua it's a quarter past ten and we also have a nice blue sky with a current temperature of 28C and rising. The PADI IDC here on Malapascua is in full swing. We have already passed the half way mark. Koh Samui, Thailand weekly weather update; 4th February 2019 – 10th February 2019; Lovely scene in Wat Pra Nah Lan in Maenam. Last week was a nice week with lots of sunshine and just a rare shower. Maximum temperature reached 31C and the minimum hit 25C. A very good and also very typical week for February on Koh Samui. 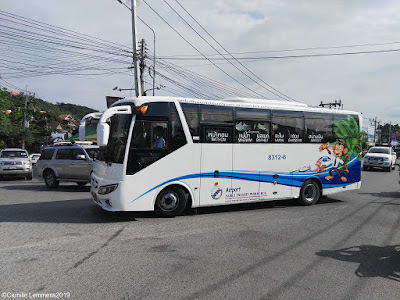 Koh Samui, Thailand weekly weather update; 4th February 2019 – 10th February 2019; One of the main roads on the small island of Malapascua in the Philippines. Small and sandy roads can be found all over the island, from South to North and from East to West. The longest road is not even 1km long, before it breaks off or goes over a trail road over a steep hill. Cars are not allowed on the island, only bicycles and motorbikes. The forecast for next week is looking good. Monday through Thursday sees a little bit of increase in wind. On the other hand, it should be plenty of sunny skies again. Maybe a tropical shower on Tuesday. Enjoy the week to come! Early Sunday morning in Cebu city in the Philippines and time for the Koh Samui, Thailand weekly weather update; 27th January 2019 – 3rd February 2019. On Koh Samui it's still dark at 6am. It's partially cloudy and the current temperature is 28C. Get ready for a sunny day! I participated in a half marathon earlier this night and did well with a 7th place all over. 21.53km in 1:44'04 or a 4'50 pace. In an hour or two it's off to Malapascua where I will start a PADI IDC tomorrow. 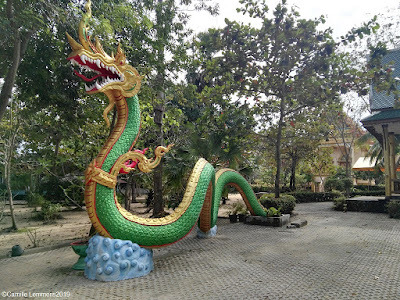 Koh Samui, Thailand weekly weather update; 27th January 2019 – 3rd February 2019; The temple entrance at Wat Pra Nha Lan in Maenam, earlier this week. 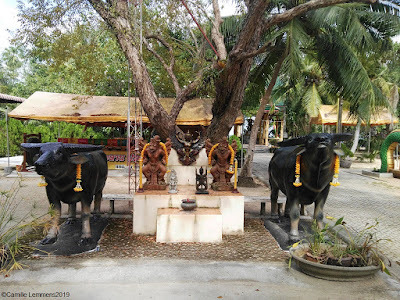 Next to the Lompraya pier. Last week was pretty much as predicted. Plenty of sunny moments throughout the week. There was the occasional shower as well but all in all it was a steady nice week. Maximum temperatures reached 32C and the minimum temperature dropped to 25C. Fairly typical for this time of the year! 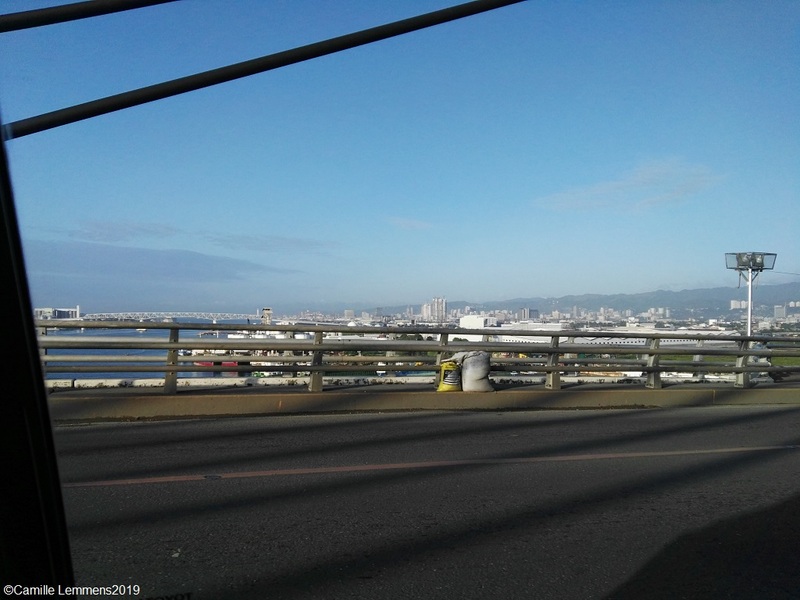 Koh Samui, Thailand weekly weather update; 27th January 2019 – 3rd February 2019; View over Cebu city in the Philippines when coming from Mactan airport. 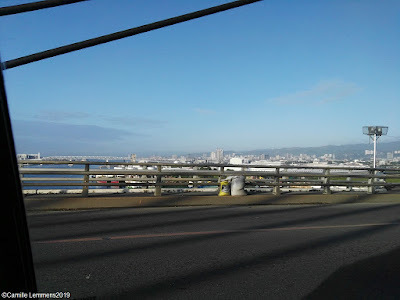 Mactan or Lapu Lapu and Cebu city are divided by a river and you need to cross over by bridges. Next week is looking good. The prediction tells us that it will be very sunny and just the slightest chance of a very tropical shower. If there's rain at all, it will almost be over before you realized it started. Looks like February 2019 is kicking off in style. Enjoy your stay on the island and go out and about! First day of the month and here we go with a warm Welcome to February 2019 and goodbye to January. Due to having a very busy day yesterday, there was no time for a Goodbye to January message. Hence its coming right now! This January started out on a scary note, with a real typhoon heading towards Samui. Luckily enough it all turned out to be a storm in a glass of water so to speak. Typhoon Pabuk just turned it's direction away from Samui and hit the mainland instead. It was wet though through the first two weeks of last month around the island. The last two weeks were more in line with that January usually has to offer, plenty of partially clouded skies and occasionally a shower. Plenty of sunshine was also to be had. Temperatures remained very nice and agreeable with slightly colder than average temperatures in the first week of the month. Welcome to February 2019 and goodbye to January; A picture of the new buses that offer free airport shuttles around the island. A massive welcome to them and a great alternative to the taxi mobsters ruining the island. Now let's move on to February. This is usually one of the nicest month to be on the island. Plenty of sunshine but not too hot. Great diving conditions in general as well. All around one of the best month of the year on Koh Samui. Most of this month I will be in the Philippines though. on Malapascua to be exactly. 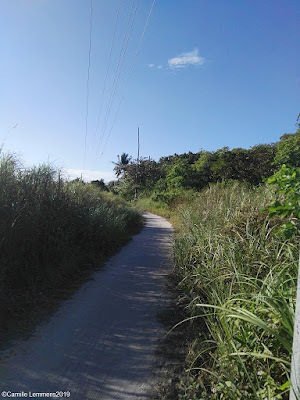 First two days in Cebu City, where I will run a half marathon come Sunday 3rd February. I will be back on Samui during the last week of this month. Do check in for regular updates though. Welcome to February 2019 and goodbye to January' A jeepney in Cebu City in the Philippines. Will be in Cebu City for two days before I move to Malapascua. 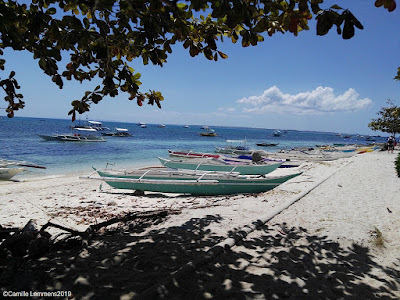 Malapascua is a small island famous for it's thresher shark sightings. I will teach a PADI IDC there.